Service trucks and asphalt, be gone. Hello, footpaths and foliage. Open space work at Homewood resumes this summer, when a significant tract of the southern portion of the campus will undergo a complete makeover. Unofficially dubbed Great Excavations II, the upcoming project is the next major phase of the transformation of Homewood into a more pedestrian-friendly and attractive environment. Implementation of the open space portion of the campus master plan began in May 2000. Steve Campbell, director of planning and project development, stands in a spot between Garland and Levering that will become a grassy plaza with trees, benches and brick paths. Behind him is Hodson Hall, an academic buidling whose completion is projected for late spring. From May to October, construction crews and landscapers will recast the area bounded by Gilman Hall to the north, Garland Hall to the south, Latrobe Hall to the east and the new Hodson Hall to the west. Mirroring the work done elsewhere on campus, the area�s asphalt sidewalks and roads will be replaced with new brick walkways, lush sod and low plantings. The overall intent is to transform the site into an appealing plaza where people will want to gather. Not only will existing trees remain in their current locations, but a number of new ones will be planted. To spruce up Garland Hall, a perimeter brick wall with a marble cap will be built. 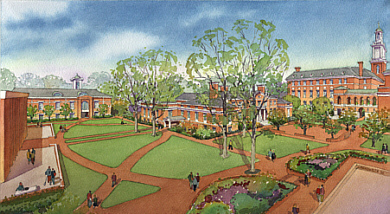 Levering Hall will soon feature a new covered southern entrance, supported by ornate columns, while in front of Levering�s main entrance will be laid an enlarged tree-lined plaza, expected to be used for student activities. To complete the picture, new decorative cast iron lampposts, wood benches and metal trash cans will be installed. Steve Campbell, director of planning and project development, says that for an expanse admittedly in need of some T.L.C., the transformation promises to be dramatic one. "The character of the area between Levering and Garland will change quite a bit, from an asphalt parking lot to a parklike area bounded by graceful brick walks," Campbell said. "The objective is to extend the natural landscape from the west precinct of campus into the core academic areas." The excavation portion of the project is scheduled to begin just after commencement, subsequent to the completion of the service road west of Hodson Hall that will support continued vehicular access and deliveries along Homewood�s western perimeter. Simultaneous to the start of construction, the road off Wyman Park Drive that leads to the affected portion of campus will be permanently closed at a point between Barton and Garland halls, with most service vehicles and trucks diverted to the western service road. The work will be conducted in two parts, Campbell says. The stretch between Levering and Garland, "Hodson Hall�s front lawn," will be completed by Labor Day, necessitated by the return of students. The remainder of the work is slated to be finished by late October. Before work begins, fencing will be installed that prohibits pedestrian traffic through the construction area. Campbell says that once again the university is asking for the community�s patience during the period of inconvenience. "The main challenge for us is the same one we had under phase one, which is that the university doesn�t really shut down," Campbell says. "We have summer conferences, we have special events. We still need to support that activity while we are cutting off the core link to campus." Access to Garland during the construction period will be through its southern entrance. Implementation of the open space portion of the master plan, which was designed by Ayers/Saint/Gross, was made possible by a generous gift from an anonymous donor. In addition to new walkways and landscaping for Homewood, the project includes new signage, improved handicapped access, information kiosks at key points throughout the campus, attractive and consistent lighting and redesigned shipping and receiving systems. For more details about the overall project, go to the Great Excavations Web site at:	http://www.jhu.edu/gx. The site will be updated frequently throughout the summer as the new project progresses. For questions about shipping/receiving changes related to the upcoming construction work, contact Judy Zimmer in the Office of Purchasing at 410-516-8383. Questions about parking changes in the affected area can be sent to the Director of Security, Parking and Transportation Services at parking@jhu.edu. GO TO APRIL 1, 2002 TABLE OF CONTENTS.